The particular beginning I’d like to tell you about is one of these grand beginnings. When I think about it, it unleashes in my head the full fireworks of the majestical opening of Monteverdi’s Orfeo (or, if Monteverdi isn’t your thing, this might do). It makes my heart sing and brings a smile to my face. And yet, to an objective eye, it probably is nothing to be excited about. You see, when I was little, my parents sent me to the music school. There I learnt to read music and to play an instrument. But there is something I could never master : improvisation. Give me a score and I’ll play it for you ; I’m even rather good at sight-reading. But there has to be a score. Without a score, I am lost. I have no idea where to begin, how to place my fingers on the keyboard, how to pick up a theme and develop it into something that sounds as if it had been carefully written. That’s simply something I am unable to do. So when I taught myself (from a book) how to knit and looked for the first time at a pattern, I thought : “There again ! Scores !” I was amazed by the sheer complexity of it. 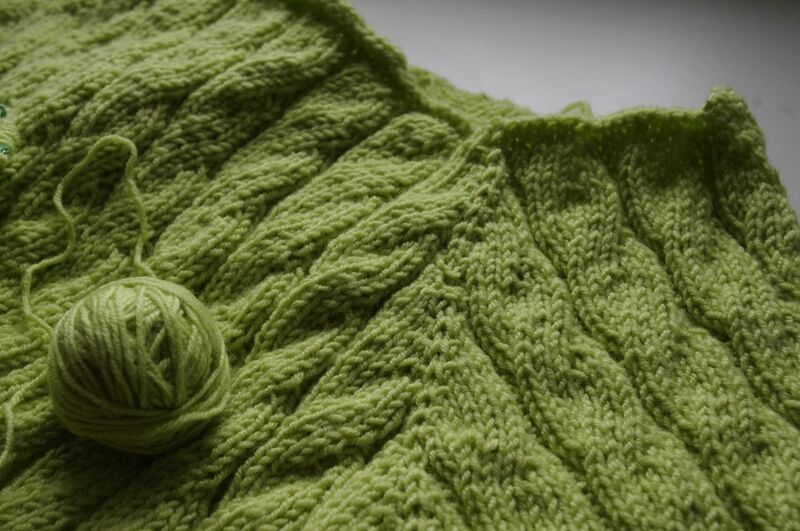 The first cardigan pattern I knit felt overwhelming. The first lace pattern felt even worse. I couldn’t see the underlying logic in it, let alone grasp how one could possibly design lace. I began to think : “Maybe that’s a recurring pattern (ha!) in my life. Maybe I’ll be a score-reader and a pattern-user for ever.” Then I noticed I was beginning to interpret patterns, exactly as I would interpret a praeludium or a sonata : changing ornaments (like edgings) here and there, modifying shapes and rhythms, twisting the genres. If I look back, there are few finished objects of which I could say : “Modifications : none.” This is, I think, because, as gifted as the designer may be, I need to put a little of myself in what I knit, a little of my heart and soul. You may see by now where all this is heading. One year ago, my grandmother gave me some yarn. 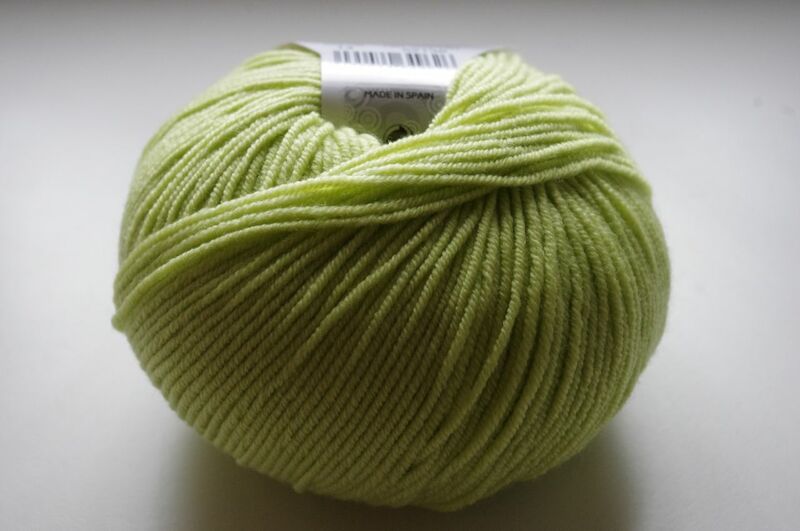 It’s green, gorgeous, merino, and there is too little of it to make a pullover or a cardigan, but too much of it to turn it into a scarf or a hat (or it would have to be a whole collection of green scarves and hats). I first spent a lot of time on Ravelry looking for a short-sleeved pattern I liked (without success), then for a bolero pattern I liked. I found it. I knit the main part of it. Then we (Mr Brindelaine, the cat and I) moved to another country. When I got back to my bolero, several months later, I also got my senses back. What on earth would I do with a bolero ? A bolero is something posh and elegant. In the past, I have tried very hard to be elegant, but had to conclude regretfully that being elegant is not for me. A bolero usually doesn’t provide much coverage in the neck and back area, and being who I am and living where I live, I’d die for cold wearing it. And that is the grand beginning. I didn’t dive head first into Designing World, though. I took my precautions and googled : “designing raglan sweater” (or something like that). I found this handy tutorial, did my math and cast on. By some miracle, it worked. Of course, it’s not perfect. I’m now past the raglan increases and I can see some mistakes : purled stitches which should have been knit on the sides of the raglan increases (because I’m using mock cables separated by purled stitches and it took me some time to figure how to integrate them, and because I’m not brave enough to do what I should : frog and re-start), cables beginning too early or to late. But anyway, it’s working. The first thing I ever cast on without following a pattern is growing on my needles. And that, for me, is enough to summon all the trumpets of Monteverdi (or of a certain far, far away galaxy). This entry was posted in Knitting and tagged designing, merino, mock-cables, raglan, short-sleeved by Julie Paik. Bookmark the permalink.